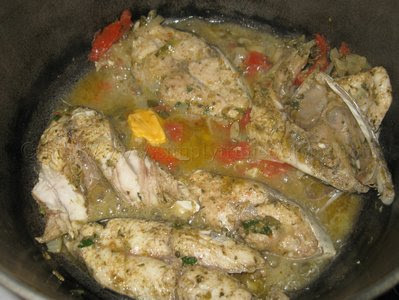 Stew fish is a popular way of cooking fish here in Trinidad and Tobago. Unlike the Jamaican Brown Stew fish, ours tend to be more on the red side because of the tomatoes and tomato paste etc. 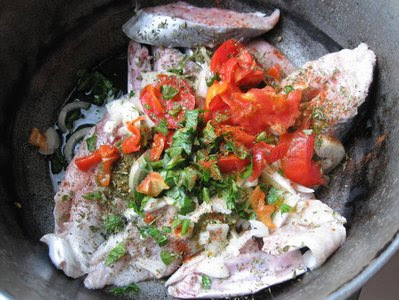 Seeing that we’re in the Lenten season this fish recipe is even more popular and today, being Good Friday and all, I know that a lot of homes would be preparing this together with provision and other sides for the Good Friday meal. When we’re stewing fish we use more of the meatier types of fish like King fish ( like what we caught off Saut d’Eau), Carite and Cavali. 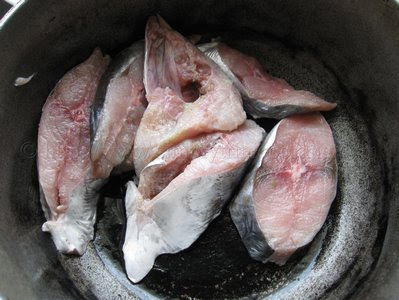 They are not that bony either, thus making them prime candidates for this stew fish recipe. 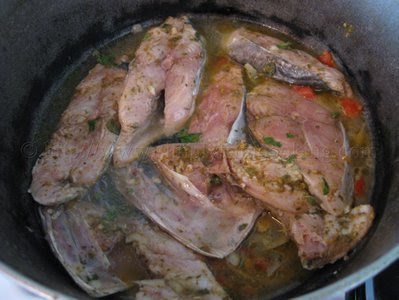 This particular method stewing fish of is just one of the ways I know of. 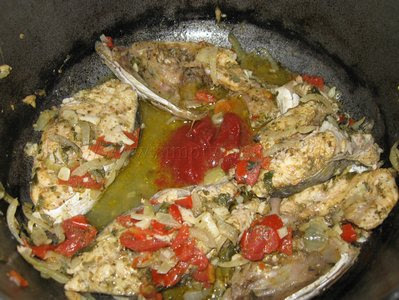 The other way involves frying the fish before placing it in the sauce. 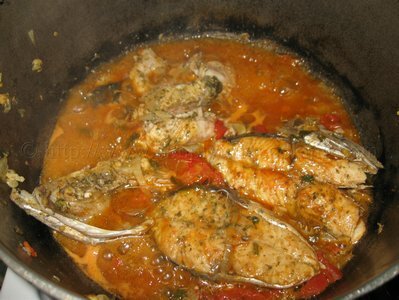 Looks like I would have to show you all that other method to stew fish in another post. 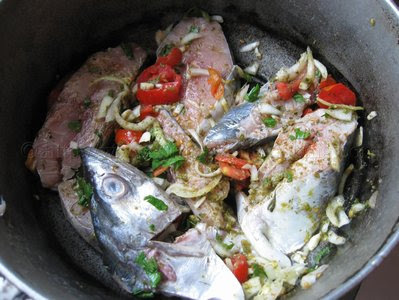 But, for today’s stew fish recipe I will be showing you all, the steam method where the fish is steamed in its own juices with the sauteed seasonings to lock in the flavour and then the …. 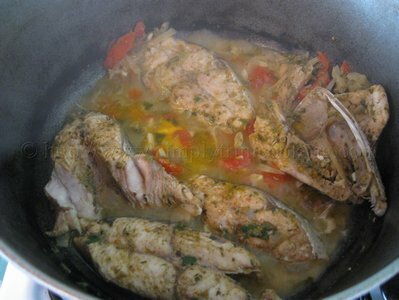 I’m talking too much, time to cook some stew fish trini style! Wash the fish with the lemon and drain. big leaf thyme, salt, paprika and parsley. 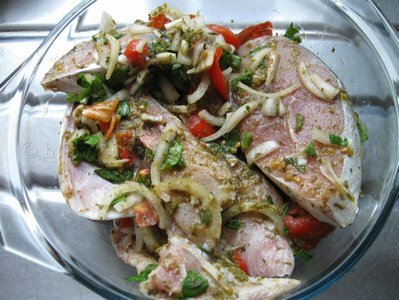 Allow to marinate for at least 1 hour. Heat the oil over a medium flame. 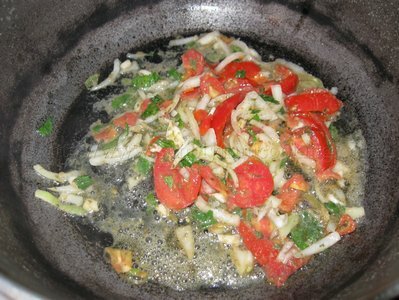 While the oil is heating, scrape the seasoning from the fish and set aside. 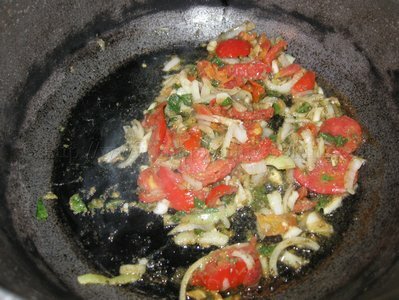 Add the seasoning and saute for about 2 minutes. 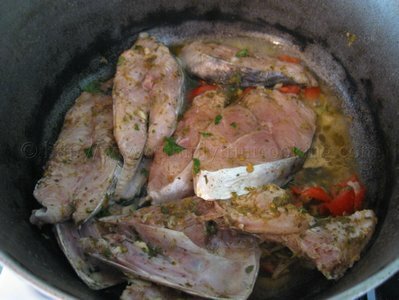 Add the fish and let it steam for 1 minute. Add half cup of water and cover the pot. 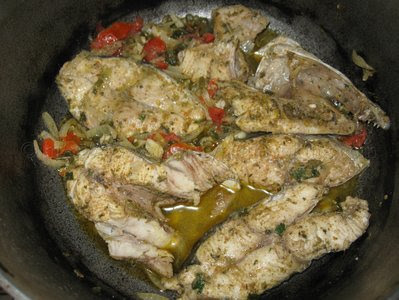 Note:Try not to turn the fish too much while cooking to avoid breaking it up. The fish looks good now! Add the golden ray margarine. 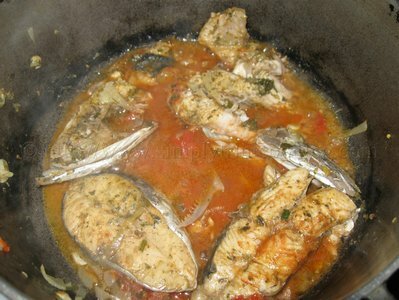 The fish is cooked but now we have to make the sauce. Allow to simmer for about two minutes. Adjust salt if necessary. 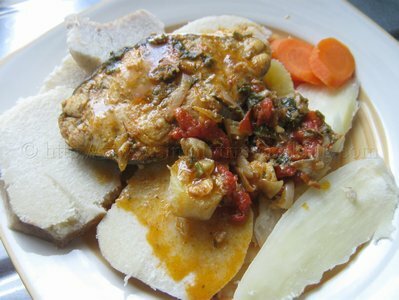 I had my stew fish with some provision: a piece of yam, cassava and a piece of plantain. Delicious! That was a meal and a half! Talk ’bout flavour! Well I hope you all enjoy your Good Friday. More recipes to come. Yes, I still have the cold but I promised someone this recipe from my facebook fanpage for Good Friday and I do keep my promises. Before I go this is what I’m planning for Today’s (Good Friday) Menu. Nice and simple don’t you think? Anyhow, it’s three in the morning I need to sleep…….Yawn! Ah gone! 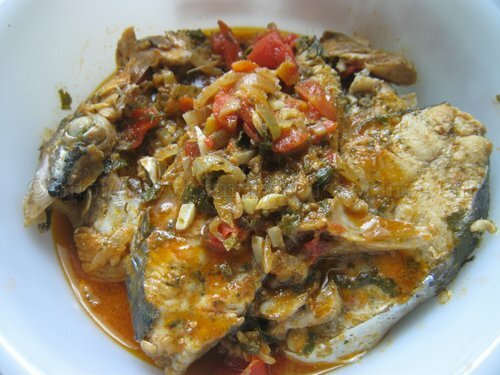 Enjoy your stew fish. I tried this receipe and it came out very well. Everyone enjoyed it. Thank you! 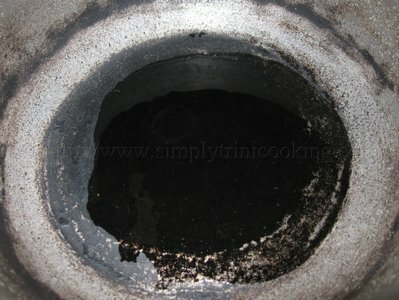 I made this for my vegetarian non-trini husband and he “lick it up”! This site is de best! 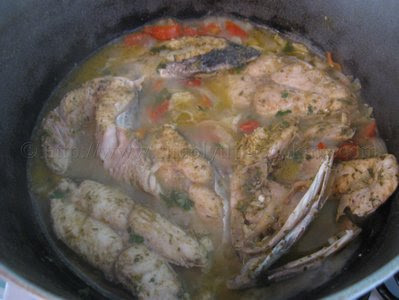 My husband is from St. Vincent and I made this today and both my husband and daughter loved it. Thank you so much for taking the time to share this recipe. Helpful information. Lucky me I discovered your site by accident, why didn’t this accident come about earlier! bookmarked. shoot you an e-mail. I’ve got some suggestions for your blog you might be interested in hearing. Either way, great website and I look forward to seeing it expand over time. It’s easy to find just scroll down to the bottom right corner of the page. Greetings to you and your Family! You’re such a lifesaver. I’ve been following your blog since 2011.I’m originally from St. Vincent and the Grenadines but resides in the USA. I wanted to explore my cooking abilities. At that time (before I got married in 2013) I wanted to master the cooking skill; so I can be a good wife and mother. Being that my husband is from Nigeria and I love my Caribbean and italian food; I just had to learn different varieties. My husband do not eat African food ;he prefers caribbean food.Normally, I would call my mom and ask her how she would cook etc. But it was time I clip my wings and be my own “woman” and learn my own dishes! 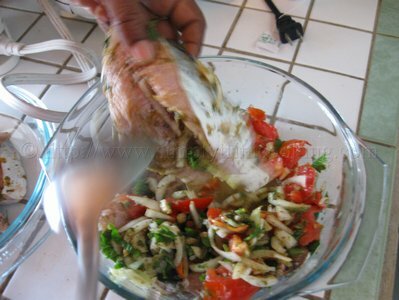 Thus far your blog is the only Caribbean food blog and was my foundation. Thank you for that!! I stumbled upon your website and “Stew fish” was my first dish because I wanted to be certain that I did not omit any steps. May God be with you and abundance prosperity, joy, love and success to you. You’re welcome but I believe it’s more of a Caribbean recipe. Thank you for your comment. Wow!! This recipe sounds great. Just like my Mum used to make. 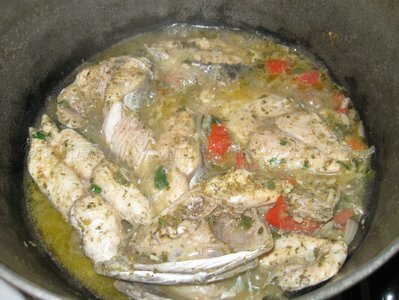 I’m eager to try this recipe, but I live in Leeds, England so where would I get King Fish or Carite from?? Or could u suggest a similar kind of fish? Thank you..
Any firm fish will do. Thank you for your recipes. I am an avid follower! Hi Felix, I tried your pepper shrimp recipe and I must say that it was the best pepper shrimp recipe that I have ever tried. This is definitely my go to recipe for pepper shrimp from now. Would definitely be trying out more of recipes and I would let you know how it turns out. Thanks again for sharing.